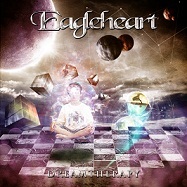 Review: "Eagleheart: Dreamtherapy" - Sea of Tranquility - The Web Destination for Progressive Music! Eagleheart, hmm... Eagleheart, I wonder what type of band could Eagleheart possibly be? Bit of a toughie that one don't you think? No, of course with a name like Eagleheart they could only possibly be a European power metal band and according to Scarlet Records they are," One of the most promising new forces in the current Power Metal scene," and "Dreamtherapy' combinines the Classic Metal sound with a fresh personal approach that makes it relevant for this day and age." Dreamtherapy is the band's second album, produced by Roland Grapow of Helloween/Masterplan fame and is, "a giant step forward in every direction: heavier and faster than ever before." Whether any of the hyperbole is strictly true, what Dreamtherapy undoubtedly is, is a thoroughly enjoyable if unessential addition to the power metal canon. It won't make non-fans of the genre sit up and listen but it isn't the dreaded power-metal-by-numbers that the band's name suggests. Edguy and Helloween are the obvious touchstones whilst the closing "Wheel of Sorrow" (in excess of twelve minutes, naturally) has more than a whiff of Blind Guardian about it. Guitarists Michal Kůs and Michal Jankuliak play tastfully and generally to the song rather than showing off their chops for the sake of it so overall I'd say that Dreamtherapy shows that Eagleheart may well have a future particularly on continental Europe.